SSC clients get valuable benefits including fiscal reports, consulting, reduced workshop fees, and many others. - Ask SSC . . . Why Should an Authorizing Agency Conduct a Capacity Interview of a Charter School? The May Revision is a statutorily required action by the Administration every year, but this will be the first year for Governor Gavin Newsom to recast his January State Budget proposals and present new proposals in view of a revised revenue outlook and stakeholder feedback. The May Revision Workshop will incorporate the results of revised revenue estimates, finalize the Local Control Funding Formula (LCFF) provisions for 2019-20, provide the latest on Special Education funding, incorporate any revisions of the accountability system, and revise the out-year estimates for LCFF funding for your multiyear projections. For many of us, federal compliance is an area that is learned through experience with very little training beforehand. Federal compliance requirements are rigorous, tedious, and often very confusing. Lack of compliance can result in significant financial penalties, additional audits, and even loss in eligibility for future funding. Recent changes in law resulting from the Every Student Succeeds Act have amended various long-standing compliance requirements, while adding new levels of reporting. As the number of students with disabilities continues to grow and overall enrollment declines statewide, Special Education costs continue to rise on the natural. State and federal Special Education revenues have long been inadequate and the enrollment squeeze only contributes to a growing General Fund contribution. In light of funding inadequacy, growing compliance demands, and increased expectations for improved student outcomes, there is no room for ineffective resource or program management. Understanding what is driving Special Education costs locally is essential in operating programs for students with disabilities that are legally defensible and that won’t break the bank. With these important issues in mind, the focus of the workshop will be on providing participants with tools and tips to help them support high-quality, cost-effective programs for students with disabilities. NOTE: As of May 2017 the content of this workshop has been verified as current (we periodically review our online workshops to ensure relevancy and applicability to current requirements and practices). The number one area for findings in an audit report are those in the area of Associated Student Body (ASB). It is critical that district- and site-level staff receive training in this area on a regular basis to ensure that the district, as well as the employees, are being protected. This online format will allow school agencies to build capacity within their organizations by expanding the number of employees that receive training who are involved in the handling of ASB funds. 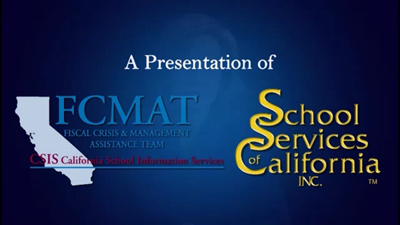 School Services of California, Inc. and the Fiscal Crisis and Management Team (FCMAT) have teamed up to provide a free online workshop on fiscal solvency. As many districts struggle with time and budget constraints, School Services of California, Inc., (SSC) has made a commitment to provide some of its foundational workshops through various modes of delivery. SSC hopes to make these workshops more accessible and meet the varying needs of school districts across California. As such, the “Fiscal Aspects of Negotiations” workshop is now available in both a face-to-face format and as an online offering. Fremont Unified School District is looking for a Chief Financial Officer. To download a Fast Pass for an upcoming workshop, click here. To use our Local Control Funding Formula Simulator, click here. SSC's offering a new attendance accounting workshop, designed for staff at the administrative and site levels. Click here for more information. Our 2019-20 Dartboard is now available on our Tools & Resources page under Budget Building Tools or by clicking here.